Avery Weigh-Tronix's BridgeMont truck scales are designed for demanding applications such as road construction, mining, quarries, asphalt applications and many others. 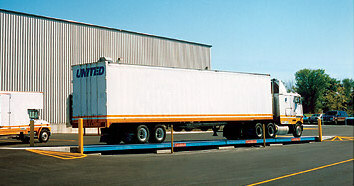 Truck scales are available for short or long term rentals, where and when you need them. BridgeMont is a ruggedly designed, self-contained, totally portable truck scale that has a 80,000# CLC & dual tandem axle rating with 3/8" steel deck and proven Weigh Bar reliability. The BridgeMont comes equipped with Bulkheads and safety guide rails. Installation can be accomplished in as little as 4 hours; put down temporary piers, install the deck modules, grade material for a ramp, calibrate, and you're ready to weigh. Rent the BridgeMont on a monthly basis or for a longer term depending on your requirements. The BridgeMont is the perfect scale that will get your job done day after day-maybe starting the day after tomorrow. Hydraulic load cells are the most rugged and long-lasting weighing devices available in the scale market. 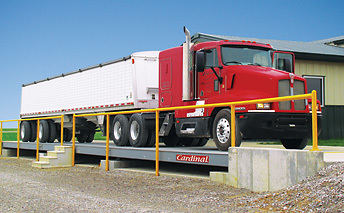 Cardinal’s extensive truck scale experience has culminated in developing the Guardian Hydraulic Truck Scale, the most dependable truck scale you can buy. If you're in the business of moving mountains or truckloads at a time, then Cardinal’s extreme-duty YUKON™ is your truck scale of choice. Designed and built specifically for the mining industry and offroad vehicle weighing, the NTEP legal-for-trade YUKON™ features an amazingly-high, 70-ton concentrated load capacity with extra-thick, heavy-duty steel deck plate. Weigh multiple axles all in one weighment. 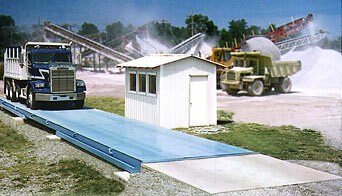 Multi-platform scales are built to the user specification as to size or capacity. Available as an above ground (pictured right) or pit installation, single platform for single axle weighing or multiple platform for accurate weighing of all axles simultaneously. Cardinal’s SnapStream is a fully-integrated NTEP legal-for-trade wireless scale system for commercial applications. It’s completely proprietary to Cardinal Scale and offers a number of competitive advantages for new or pre-existing scale installations. In brief, SnapStream allows a scale to send weight data wirelessly to an indicator and the indicator in turn to send that data wirelessly to a host of peripheral equipment such as remote displays, printers, PC’s and networks. Cardinal Scale's truck scale manufacturing processes have been featured in a Fall 2008 episode of cable TV's popular program "How It's Made" airing on the Discovery Channel. 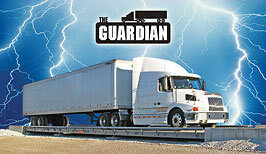 The segment details the production of a 70-foot-long electronic Cardinal truck scale. Beginning on a microscopic level with the creation of the strain gauges that reside in the scale's load cells, the educational program charts the manufacturing course of a Cardinal model EPR truck scale. It proceeds to show the welding processes involved in the steel tubing and load cell stands, the powder paint process, and final assembly where the finished truck scale is shown with test weights being applied to measure its superb accuracy.